Who doesn't love to pamper themselves with a special treat like chocolate covered strawberries! I'm sure most of you probably already know how to make these but for those of you who don't I thought I would go ahead and make you a blog... since I was already making these yummy babies anyways. 1. Ahead of time place a piece of wax paper over a cookie sheet. 2.In a microwavable friendly bowl add 3-4 squares of milk chocolate.﻿ You can also do this on the stove, just I prefer the microwave. 4. Add about 1-2 tsp. shortening to chocolate and stir. The shortening helps with making the chocolate creamier and I think makes a smoother covered strawberry. 5. Place coated strawberries on the wax paper, finish coating strawberries and allow to harden. 6. While your waiting for your strawberries chocolate to harden, start heating your white chocolate the same way as the milk chocolate. Again adding 1-2 tsp. shortening to melted chocolate. 7. 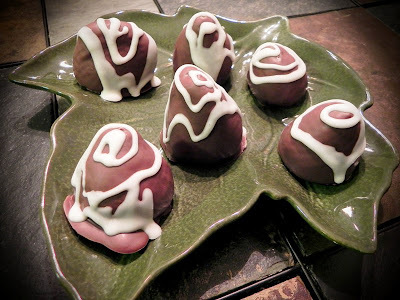 Using a spoon, a cake baster, or a ziploc bag (filled with the white chocolate and a small corner cut) swirl the white chocolate over the strawberries. Just enough to give color. Allow to harden and enjoy! You can also place these in the frig to cool if you just can't wait another moment! Reverse the chocolates making white with milk chocolate topping it. Get real fancy and top with crushed peanuts, shredded coconut, mini chocolate chips, crushed oreos, or a mix of several! Just be sure to add those toppings to the chocolate while it's still warm. After it sits a moment you won't be able to add extra toppings. I use a fork on the cut side to dip the strawberries. Dip it at an angle so the strawberry doesn't constantly fall off your fork. Adding the shortening also helps with dipping and not being too thick. This is a fun and easy treat to get the kids involved in too! Share your favorite dipped treats with us. Enjoy! Those look yummy! We bought some huge strawberries at Costco last week. Mary and I just love them! Thanks, they were. I don't think they even lasted a whole day. I was so excited when I went to Sams and saw they were in season again! In the future we will me making all natural fruit roll-ups with strawberries!